Species name meaning 'elliptic' referring to the leaves. Rennellia speciosa var. angustifolia Ridl. 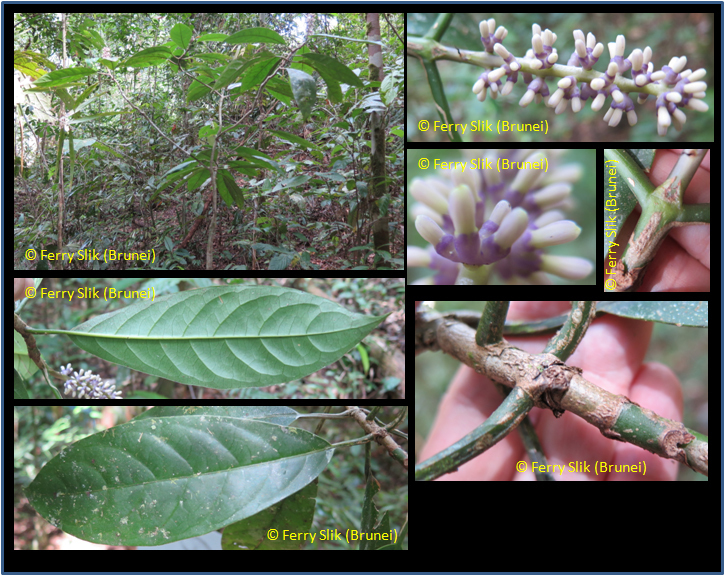 Small tree or shrub, 1.5-2 m height; stem lignosus; leaves elliptic, 8-23 cm long, glabrous, dark green or pale green coloured; petiole long; inflorescences terminal; flowers white or dark purple coloured, very fragrant; corolla tube purple coloured; infructescence terminal; fruit globose, green coloured. Found along riverbanks or lowland forest, at altitude 40-650 m above sea level. Decoction of the roots is taken by the locals for general good health and also claimed to be antidiabetic. Borneo: Kayu Penawar Apow (Dus. ), Mengkudu Hutan (Ib.). Sumatra: Jarum-Jarum Betina, Kayu Kuni, Kayu Kemik (Minangkabau).